The start of a new year is always a time of hope, change, and the dreaded diet! This is the month you pay back the excess eating and drinking that we simply can’t avoid / won’t avoid over the festive period! Don’t get me wrong, it was worth every mouthful but all the wine, beer and mince pies that were crammed into our shopping trolleys in December had to go somewhere! And for many of us, that somewhere is around our midriff! If like me, you’re nearing or enjoying middle age then you will know that with each passing year those extra pounds become harder to shift. I often wonder how many new gym memberships will start this month, and how many packs of beers will be hidden in the back of the cupboards. Giving up the things we enjoy can be stressful and it takes a huge amount of willpower to abstain completely. So, it stands to reason that finding a better balance throughout the year would be easier. I’m no expert, but what I do know (and am prepared to stand on my soap box about) is that the quality and quantity of food you eat has a direct relationship to your level of health. Everyone who knows me knows I love my food and my exercise in almost equal measure. There is nothing better than a good run to clear the cobwebs and get the brain cells revved up and good to go again. When we were training for the quadrathlon a couple of years ago I started to take up different classes and looked at other ways to keep my body and mind fit. When you’re ploughing across your 6th munro it’s as much mental stamina as physical stamina you need and I found it fascinating to look my wellbeing as a whole. Since then I’ve read a lot of strange books by some pretty out there people – I think Fiona’s getting worried that I’m having the weirdest mid-life crisis ever! Still, at least I’ve not come home with a Porsche. So, in a bid to move forward with this holistic approach I’m doing 8 minutes of meditation a day and I’ve taken up yoga. 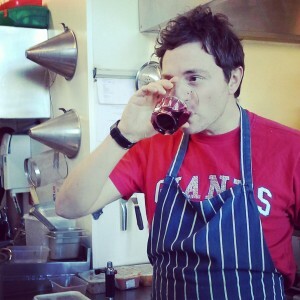 Now, I may be setting myself up for a right ribbing from some chef buddies with that little admission but it does say Honest in this blog’s title! If you’ve ever done yoga in Perth, chances are you know Cathy (no second name required). I’ve been going along to her Monday class at Live Active Rodney and I am going to put my hands up and admit that in all the years I thought yoga was a bit of stretching and chanting, I was wrong. So, so wrong! I thought running up a mountain was hard but the day after my first class I couldn’t even cross my legs! But, if you want to lose weight and feel fitter and healthier, it isn’t just about getting your trainers on and going for a run, or getting your body into weird and wonderful positions! It’s about turning your body into a well-oiled, well-maintained and efficient engine. The only way you can achieve this is by focusing on the food you eat. I guess the big question is, does eating well mean cutting out all the fun things in life, like pizza and beer? Well… I don’t think so. Like everything, it’s a bit of a balancing act. I follow the 80-20 rule. For 80% of the time I eat as healthily as I can so I can enjoy the odd chocolate bar or bottle of Bud. I also take supplements and I can’t begin to tell you how much better I’ve felt with a daily dose of vitamin D. We live in the Northern Hempisphere, in Scotland, where the sun disappears for half of the year. Apparently 90% of Scots are lacking in the sunshine vitamin and I, for one, am happy to take it pill form if it leaves me feeling happier! Because the truth is, we’re all busy and finding the time to make sure we get the right nutrients into our bellies can seem near impossible sometimes. From my own experience (and my whacko hours) it can be downright frustrating. So as well as the vitamins, I‘ve welcomed in the joy of juicing! If you have a busy routine you could probably benefit from investing in a cold-press juicer. I promise I’m not on any commission I’m just letting you know what I’ve found handy! Believe it or not, I sometimes struggle to get full portions of fruit and veg inside me as I can spend days grazing and tasting at wee bits. The juicing can be complicated at first as there are so many flavour combinations – my tip is DON’T go for a garlic and kale combo. Convinced it would be super good for me I gave it a go and OMG…. It tested my ‘never throw food out’ rule to the max! I forced it down, gagging and thinking of burgers for at least half an hour! There are, however, plenty of great recipes out there now so I’ve had some fun experimenting. It’s a good idea to restrict fresh fruit to 2-a-day as the fructose level is quite high (and that’s basically sugar!). But you can use as many vegetables as you like. After a few more strange concoctions I’ve hit upon a couple of ‘cocktails’ that I love and I know are very good for me. 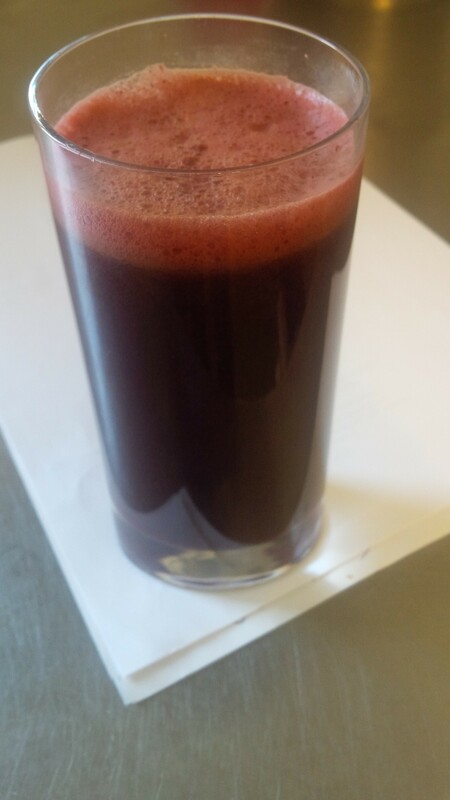 Try 4 carrots and 2 fresh beetroots with a little ginger. Or for a wonderful detoxing juice, use 2 whole cucumbers, 2 pears, a whole lime and some fresh mint. Just quickly chop them all up, and press away, skin and all. There you go, that’s my bid to stay healthy, now laid out for everyone to read. A good breakfast every morning, cold-pressed juice, drinking plenty of water and eating an extra couple of portions of fruit and veg each day have made a huge difference to my energy levels and general wellbeing. And of course, Cathy’s yoga is proving that you don’t need to climb a mountain to give yourself a workout!